""STONEWALL 25 MAINE "ALL WE'RE ASKING OF AMERICA IS TO BE TRUE TO WHAT"
"STONEWALL 25 MAINE "ALL WE'RE ASKING OF AMERICA IS TO BE TRUE TO WHAT IT's SAYING ON PAPER!" MARTIN LUTHER KING"
White t-shirt. 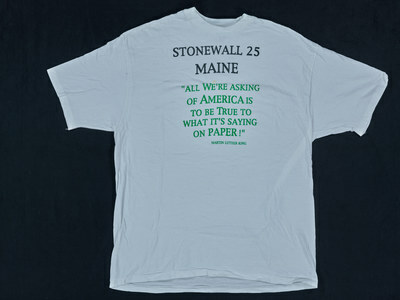 Text: "STONEWALL 25 MAINE "ALL WE'RE ASKING OF AMERICA IS TO BE TRUE TO WHAT IT's SAYING ON PAPER!" MARTIN LUTHER KING"
""STONEWALL 25 MAINE "ALL WE'RE ASKING OF AMERICA IS TO BE TRUE TO WHAT IT's SAYING ON PAPER!" MARTIN LUTHER KING"" (1994). T-Shirts. 32.